Leptospermum scoparium is a shrubby tree native to New Zealand and southeast Australia. It belongs to the same Myrtaceae family as Tea Tree, but is not the same plant. The common name Manuka comes from the Māori ‘Mānuka.’ It is also known as New Zealand Tea Tree, manuka myrtle, and jelly bush. After a fire, manuka is one of the first plants to colonise bare land. The Maori traditionally used the leaves and shoots for various skin complaints and diseases, infections, wounds, fever, rheumatism and respiratory problems. Bees use the nectar from the flowers to produce the well- known Manuka honey. Manuka Oil is steam distilled from the prickly leaves, bark and flowers. It has a dark yellow colour and a medicinal, woodsy smell that is more subtle than Tea Tree Oil. Like Tea Tree Oil, Manuka Oil is complex with 100 identified constituents. Climate, soil and other factors influence the exact composition of Manuka Oil but the plants growing in the East Cape of New Zealand have the highest content of trichetones, flavesone, leptospermone and isoleptospermone. Manuka Oil has strong antimicrobial, antifungal and antiseptic properties and is also anti-inflammatory. It is similar in many ways to Tea Tree Oil but with a few key differences. Manuka is a selective antibacterial agent. Whilst Tea Tree Oil is a universal antiseptic, Manuka Oil is 33 times stronger against certain bacteria, including the drug resistant Staphylococcus aureus, commonly known as MRSA, yeast, viruses, and fungi. Manuka balances skin bacteria and has a protective effect. It relaxes the nerves of the skin, making it more resistant to bacteria and helps skin regenerate itself. 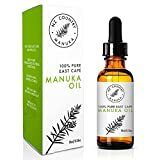 The triketones in Manuka Oil have anti-histamine and anti-allergic abilities – they seem to limit the spread of toxins in allergic reactions to bites and stings and so calm irritated and itchy skin reactions. Manuka Oil is also effective against the Demodex Folliculorum mites that accompany rosacea. Manuka is helpful for a wide range of skin problems, particularly for sensitive skin that is prone to allergic reactions. It can be used for itching, acne, badly healing skin, bed sores, fungal infections, ulcers, blisters, boils, burns, cold sores, dandruff, eczema, impetigo and insect bites. It can be used neat for spot treatments and diluted in creams and moisturisers for larger areas, as well as in shampoo. For sensitive skins a 5% solution or less is recommended. Manuka Oil can be used in a diffuser for respiratory problems and diluted in water as a gargle for sore throat. As an ingredient in soap, Manuka Oil is great for reducing body odour and for protection against bacterial infections. Used in massage, Manuka Oil is good for aching muscles, rheumatism and arthritis. Manuka oil is a fairly recent addition to aromatherapy where it is said to be calming, mood balancing and a real ‘feel good’ oil. It is suggested for general anxiety and people with a nervous disposition. 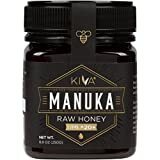 This is interesting because apparently Manuka means nervousness or anxiety in the Maori language. Process the sesame seeds briefly (a coffee grinder works well.) you want them to be just broken up and still dry. If you overdo it, they will turn into sesame butter. Put in a bowl and add the sweet almond oil, honey, Manuka Oil and then the Bergamot. Stir well until smooth. Empty the whole amount into a warm to hot bath and soak for 20 – 30 minutes, topping up with hot water as required. Drink a glass of water afterwards and lie down for at least half an hour or alternatively do this just before bed time.